Shirin (Merila Zare’i – Best Actress, Fajr Film Festival), is a woman facing problems in her marriage and with her child. She’s desperately trying for a way to connect with her son and her husband. One day one looks and sees that it seems nobody sees them, neither their partner, nor their own selves. Pouran Derakhshandeh (March 27, 1951, Kermanshah, Iran), is an Iranian film director, producer and screen writer. Pouran Derakhshandeh graduated in film directing in 1975 from Advanced School of Television and Cinema in Tehran. 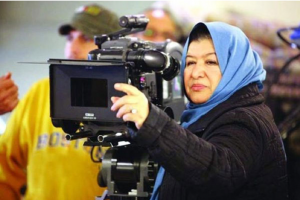 She started her professional career by making documentary films for the Kermanshah Television and subsequently for the Tehran Television. At the time she began working at NIRT and Produced “Plague,” a documentary about plague disease in Kurdistan Province. Next year, she produced a documentary about “Last Wednesday of the year “Ceremony in some areas of Iran. In 1978 she director “mineral springs of rah haraz” and a trilogy doc about handicraft in Kurdistan titled, “Moj, janamaz and sajadeh”, “Nazok kari” and “short –napped coarse carpet”. Four episode “syn the tic and natural Fibber” was a research documentary about thread, worsted cotton, silk and synthetic fiber. During 1979-1980: Pouran Derakhshandeh Produced “the wheels whirl”. It has a look to economical and society depression and closed manufactures like Iran National. A “Shokaran”, focused on addiction 17 episode doc. Difficulties in women /men and children, drug’s smuggles and its Prevention ways. The production longed from 1980 to 1982.